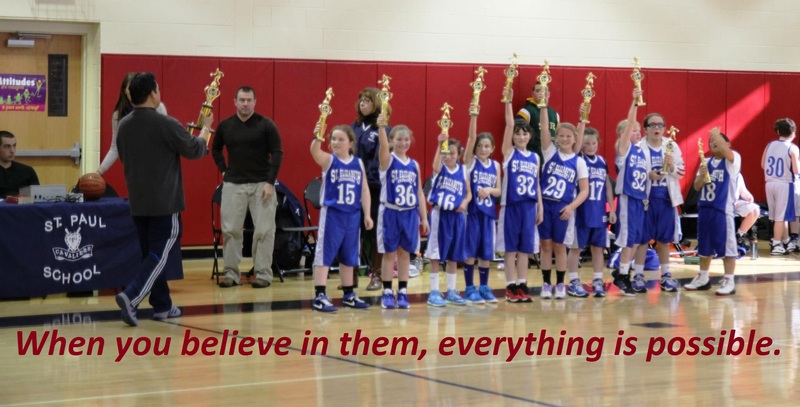 In the fall of 2012, my nine year old daughter decided that she wants to join St. Elizabeth 4th grade girls basketball team. I recognized that this would give me an opportunity to be part of her activity so I volunteered as an assistant coach. A few weeks before the season started, I received a phone call from the commissioner of our school that our team did not have a coach. He suggested that I think about volunteering as the head coach. I was not sure I was up for the challenge. I spoke to my daughter and asked her if she really wanted to play basketball. My thought process was, if I can convince her not to join, then I’m off the hook. But she insisted that she wanted to play and urged me to coach the team. That night I pondered on the responsibility as a head coach and its demand. As it is, my work demand is high, but then I still want to be part of my daughter’s activity. In my mind, I did not want to miss out on the opportunity. During the next two weeks, I worked on my schedule and tried to move things around so I could be available. I gave the commissioner a call and informed him of my decision to coach my daughter’s team. That night I was left wondering if I have what it takes to coach the 4th grade girls basketball team. I used to play basketball, but the last time I played was about 15 years ago. The last time I coached a team was back when I was a senior in high school coaching the freshman team. Over the next few weeks, I prepared for the upcoming season by reading books, practicing and watching videos. I realized that I was putting in a lot of time and effort. As always, I never do things halfway. If I decide to do something, I often put in 100% effort and try my best. That’s how my father taught me growing up. You need to always try your best. The outcome might not be what you expected, but as long as you tried your very best and put in your best effort, that was good enough for him. It is the same values that I passed along to my daughters. A great addition to my team was the daughter of my former co-worker, who offered to help me coach my team. I was anxious about our first practice. I started the session by asking the girls why they wanted to play basketball. Each of them gave me their reason and I gave them my objective for coaching the team. My focus for the practice was learning the fundamentals, teamwork, sportsmanship, trusting one another and having fun playing the game. Our first game was against St. Anthony. When we walked in the gym, I was surprised to see the girls on the other team were a lot taller than the girls on my team. I kept my composure and focused on our game. I knew, if we played our game and focused our defense, we had a chance to win the game. The first game went really well and we won the game. We also taught the girls sportsmanship by stopping from scoring once our lead was over a dozen points. It was a hard concept for them to understand, but in the end they understood why it is important for us to respect our opponent. Over the next few games, the team learned to work through adversity and won a couple of close games. Before we knew it, we had won five games in a row. Some folks approached me and congratulated me for a job well done, but I kept on saying that it was the team that did all the work. I often attributed our success to the team’s commitment to teamwork. I also found out that there were some reservations that this team might not do well this season. From my perspective, there was no doubt that my team was capable of winning games, because of their commitment to learn and work hard at all times. We closed the season with a loss, but that loss taught us a valuable lesson, that we need to play the entire game and we cannot just show up the second half. We lost by a point. I told the team that I was proud of them for coming out and playing well the second half. The team remained hungry and eager to prove themselves. We won our semi-final game and went on to play in the championship. In the championship game, we faced the same team that we played three close games during the season. We won all three games, but I emphasized to my team that we could not take them lightly. Before the start of the game, I told the girls that I was so proud of them for working hard all year and they should enjoy this game. I told them that I believed in them and that we needed to leave everything on the court and be aggressive. I stressed that we needed to come out strong and played our game. We led the first half, but then they came back and led by 4 points with less than 3 minutes to go. We were out of sync. I called a couple of timeouts and during each one of the timeouts I told them that I believed in them that we could come back from the deficit. I reiterated that I believed in them and did they believe in themselves. They responded “YES.” We proceeded to score a three-point play, then another basket that gave us the lead. We won the game by a point. The girls were so happy and everyone came running onto the court. I was so happy for the girls. They played hard and came back to win the game. This win demonstrated that with hard work, dedication and commitment we can overcome all obstacles. I told them that I’m really proud of them. During the awarding ceremony, I thanked the host of the event, our opponent, AOL, who played four great games, the parents for their commitment, my assistant coaches for their contributions, and my players for working hard all season. We completed a magical season in which we compiled an 11-1 record. Be patient – Patience is the most important virtue. By stepping back and learning to listen to them, I was able to help them learn the fundamentals of basketball and enjoy it in the process. Believe in them – I never doubted my team’s capabilities. From day one, I knew that with proper coaching and support my team’s capability was unlimited. I saw the joy in their eyes whenever they came to practice and played the game. Work hard – There were days in which I felt like I was working two jobs. I put in 100% at work then came home and worked on the lessons and plays for my team. Never give up – My personal approach applies to my team. I never gave up on them and continued to encourage them to try their best until the time runs out. This resulted in winning 6 close games, five of which we came from behind to win. Affirming that I believed in them was the first step in accomplishing our goal. Keeping my composure – Throughout the season I kept my composure and never showed that I was worried. I kept on encouraging my team to work through it and never waver. Apply effective feedback – Whenever they made a mistake, I often encouraged them to reset and forget the mistake and focus on the next play or shot. When a player was not playing well, I provided encouragement and engaged them in a one-on-one dialogue. I’m truly thankful for the coaching opportunity. I’m so glad that I took this opportunity. I spent time with my daughter and formed a bond and shared an experience that we will share for a lifetime. I will always remember this experience. It reinforced my belief that I always have to seize the moment and make the most of the opportunity. Go Crusaders!